Mixed media works by Shanghai-based art collective Liu Dao combining LED displays with painting, collage, and photography. Many of the pieces display a cynical, tongue-in-cheek, dark sense of humor that are fun to look at. A work entitled Dusty Old Memories shows a woman dusting a carpet with what looks like a fly swatter while dirt gets on her hair and clothes. In Breakage 101, a man with a sledge hammer pounds on a Ming vase without regard for its value. The collective, which consists of tech geeks and creative talents driven by innovation and interaction, produces cutting edge art that contemplates the future of Asia, engages sights and scenes from old and new China and elevates the skills of new talents by working from a communal forum. Liu Dao’s LED art techniques draw from each member of the collective, involving actors, models, directors, choreographers, cameramen, and computer programmers to produce the finished works. The information on the chip within the artwork is communicated by a signal passing through each LED unit, spreading like senses in the delicate framework of the human sensory system, through the physical world and into the mind. The images are presented in frames of all sizes as well as three-dimensional light towers featuring multi-surface displays. 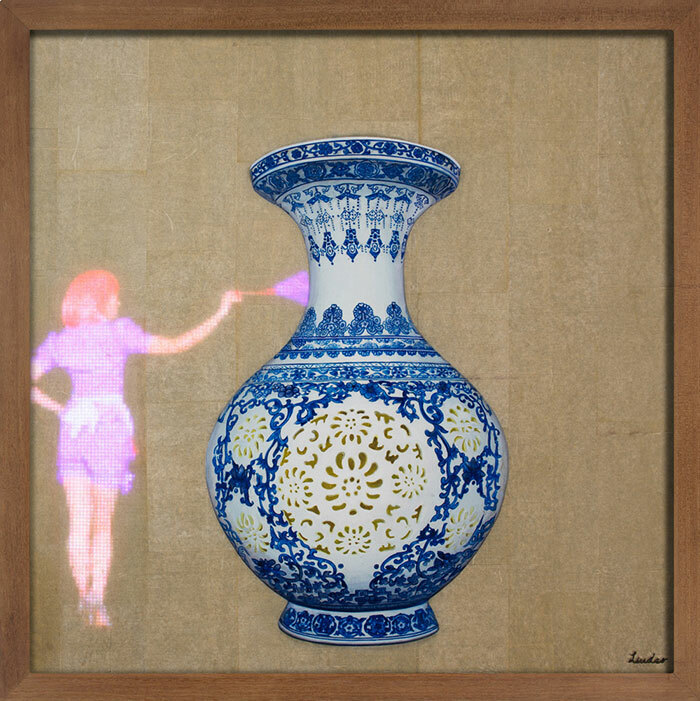 Mixed media works by Shanghai-based art collective Liu Dao combining LED displays with painting, collage, and photography.